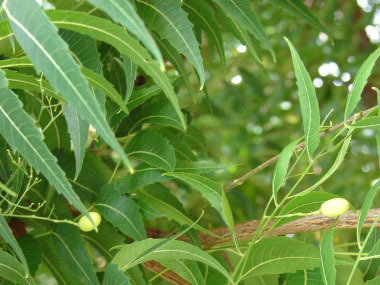 The Neem tree, Azadirachta indica, is in the Meliaceae (mahogany) family. Also know as Nimtree and Indian Lilac, neem is a large deep-rooted tree that is fast growing with many uses including medicinal properties. 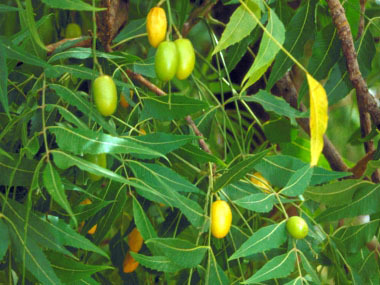 This tree is native to the Indian subcontinent (India, Nepal, Pakistan, Bangladesh, and Sri Lanka). It is categorically an evergreen, but in severe drought it may shed most or nearly all of its leaves. 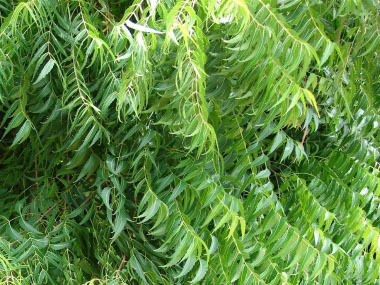 Neem is referred to as being a weed tree in many areas, including some parts of the Middle East, northern Australia and much of sub-Saharan Africa. Large infestations have also been observed in West African nations. The name Azadirachta comes from: Azad means free; Dirakht means tree; and i-Hind means of Indian origin. Trunk/bark: The trunk is straight. Neem bark is hard, rough and scaly, and fissured even in young trees. It's often brown, but older trees can be pale or greyish-black. Branches/twigs: This tree's spreading branches form rounded crowns as much as 20 metres across. It makes an excellent shade tree. 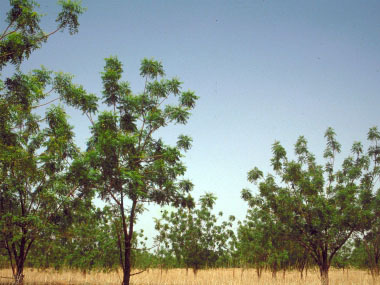 Height: Neem can reach a height of 15 to 20 metres, though it occasionally reaches 35 to 40 metres. Leaves: The opposite, simple pinnate leaves are 20 to 40 cm long, with 20 to 30 medium to dark green leaflets about 3 to 8 cm long. The leaf petioles are short. Young leaves are reddish to purplish in colour. Leaf margins are toothed. 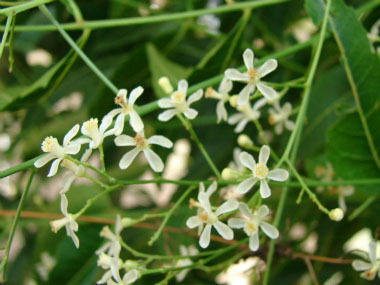 Flowers: Neem flowers are white and fragrant that arise from the junction of the stem and petiole. They are normally in drooping flower clusters (panicles) which are up to 25 cm long. These branching inflorescences, bear from 150 to 250 flowers. An individual flower measures 5 to 6 mm long and 8 to 11 mm wide. Fruit: The fruit is a smooth olive-like drupe which varies in shape from elongate oval to nearly roundish. When ripe they measure anywhere from 1.5 to 3 cm by 1 to 1.5 cm. 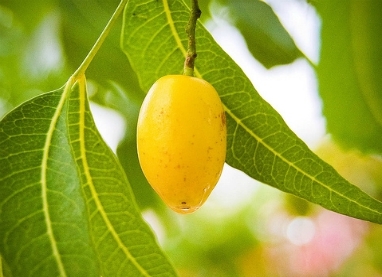 The fruit skin is thin and turns yellow when ripe. The bitter-sweet pulp is yellowish-white and very fibrous. The white, hard inner shell of the fruit encloses one, rarely two or three, elongated seeds. Habitat: Neem likes open woodlands, grasslands, floodplains, riparian zones, coastal sites and other disturbed natural vegetation. It can grow in semi-shade or full sun. It prefers dry or moist soil and can tolerate drought. It cannot survive freezing temperatures or being waterlogged. 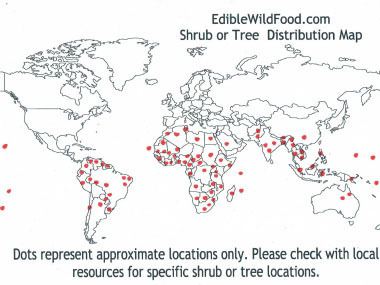 Neem has naturalized in northern Australia, Southeast Asia, parts of Africa, Fiji, Mauritius, Puerto Rico, the Caribbean and many countries in South and Central America. Edible parts: Edible parts include the fruit, leaves, flowers, and sap. Young leaves are cooked and eaten in parts of Asia. According to PFAF, leaves can be eaten raw or fried along with other vegetables. Flowers are used as a flavouring. Fully ripe fruit pulp is eaten raw or cooked and used for drinks. Refined oil from the seeds can be used for cooking.